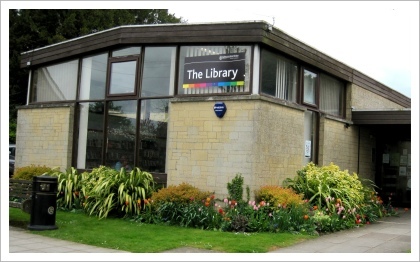 The Library, situated at the top of Close Gardens, was another building that occupied an area of land that had an air of being unloved and uncared for. A large pyracantha, surrounded by a bed of weeds, had been allowed to grow out of control with just the occasional pruning and the old rose that was propped up against the wall had certainly seen better days. 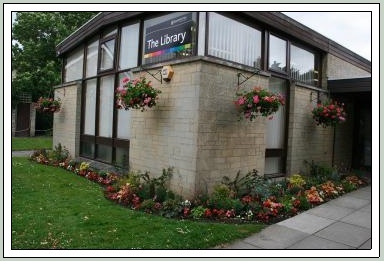 In Spring 2008 with the initial idea of just trimming back the pyracantha, and tying up the rose, we went to give the library a quick tidy. It only took a few minutes before we realised that we were wasting our time and it needed a complete makeover!! 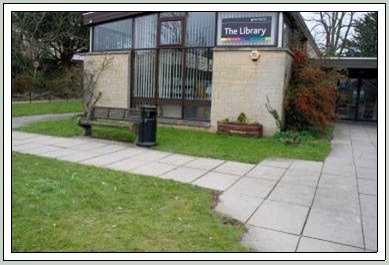 Spurred into action, and with the permission from the Gloucestershire County Library Division, the old overgrown pyracantha came out together with the old rose and a new bed was created that wrapped round two sides of the building. Sue Hirst and Ange Morrissey chose shrubs and perennials to be the main frame work for the new beds and these included white chaenomeles to climb the walls, yellow choisya, tall & low growing phlox, spiraea ‘Gold Flame’, hebe, heuchera ‘Crème Brulée’ & euphorbia. Four new brackets and hanging baskets were fixed to the walls and a mixture of pink and white begonias and pink, yellow and bronze coloured antirrhinums were planted in the beds to add extra colour through out the summer months. 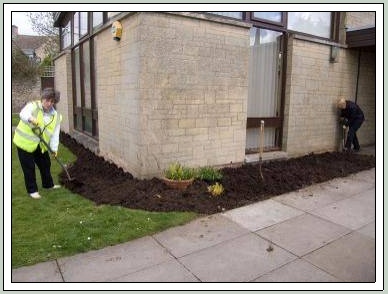 In the Autumn of 2008, daffodil and tulip bulbs were added to the beds to bring colour in the Spring. This makeover has completely transformed this area and is hugely appreciated by the very many people who not only use the building but who also walk along the pathway to cut through to the centre of town. Like all gardening over the years things grow and mature and in 2013 we decided that the bed had become all too 'blobby' with the hebes, choisya and spiraea all becoming the same size and shape. Our solution was to widen the bed very slightly and remove the hebes and replace them with lime green and yellow phormiums which suddenly brought a whole new look to the bed. With the spikey leaves they broke up the 'blobbiness' perfectly, although perhaps they like it in this position maybe a little too much!